an exceptionally lucid, challenging and innovative book about an important legal topic ... succinct and excellently structured text ... Porat and Stein’s admirable text is one so timely, well expressed and ambitious in its aim that no scholar working in the field can afford not to read it carefully and address its thesis with determination. The most thorough and interesting wholesale revision of tort law's conception of causation. 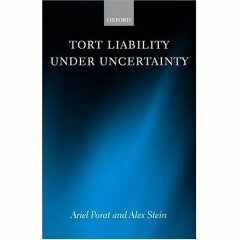 Order Tort Liability under Uncertainty from Oxford University Press or from Amazon. Tort Liability under Uncertainty offers a comprehensive analysis of the liability problems that arise in connection with causally uncertain damages. The book critically discusses the American, English and Israeli case-law, along with scholarly writings that appeared across the globe, and offers a number of innovative solutions to the uncertainty problem (one of those solutions was incorporated in the Third Restatement of Torts). Specifically, the book examines the allocation of the burdens of proof in cases featuring causally uncertain damages; the res ipsa loquitur doctrine; collective liability rules; and liability for creating risk. The book’s final chapters develop the evidential damage doctrine (with respect to which the book has become a standard citation in Israel, following the adoption of its authors’ idea by the Israeli Supreme Court). II. Strong Presumption or Weak Presumption? II. Is Collective Liability Justified?